Fireworks are tested against the British Standards Institute (BSI) BS7114:1988. Part1 Classification of fireworks :- defining the fireworks and placing them within four categories. Category 1: Indoor Fireworks - Suitable for use indoors. Category 2: Garden Fireworks - suitable for outdoor use in relatively confined areas i.e. gardens. Minimum viewing distance 5m. 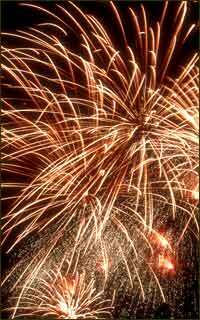 Category 3: Display Fireworks - suitable for outdoor use in large open space. Minimum viewing distance 25m. Category 4: Fireworks which are incomplete and/or are not intended for sale to the general public. Often referred to as 'professional fireworks' No minimum viewing distance specified. Part2 Specification :- dealing with construction, performance and labelling. Part3 Methods of test :- Standardised tests to assure compliancy in a consistent manner.